everyday vita: an apple a day keeps the doctor away! 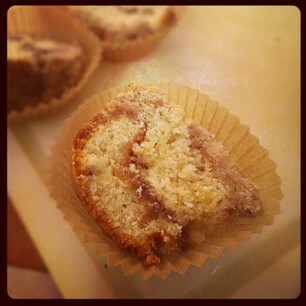 Packed up a batch of Izy’s coffee cake for mom to take to work. Made a batch of “Erin” cookies (named after my friend who inspired me to bake these) for my math class. 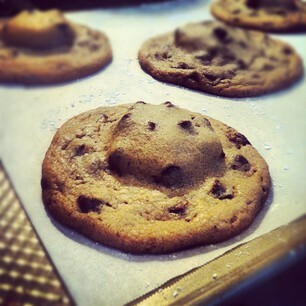 Chocolate chip cookies stuffed with double stuf oreos! 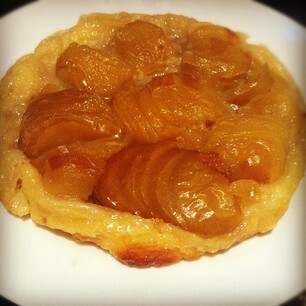 I made Orangette’s Apple Tarte Tatin! 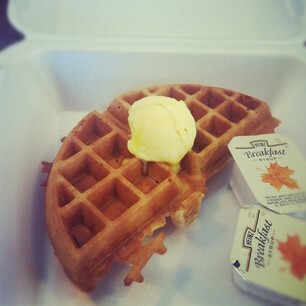 Today during my free period, I got a delicious apple+cinnamon waffle at the greasy spoon near school. Your apple tart tatin is GORGEOUS! Were you able to find round puff pastry? Don't tell me you made your own!!!! Thank you! I have to admit I did not make my own — I used frozen puff pastry! I just cut the corners off of a square sheet and voila, a round sheet of puff pastry, perfect for my tart tatin! Puff pastry aside, that's still one gorgeous tart tatin. 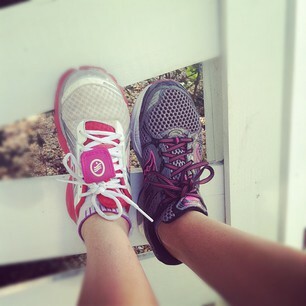 And you two are so picturesque…I need to pick up my running shoes and hit the roads again! If only I didn't have a cold starting and my immune system wasn't, you know, the suckiest ever. Maybe I need to start with an apple a day, too (in mah coffee cake, say what?? heh).